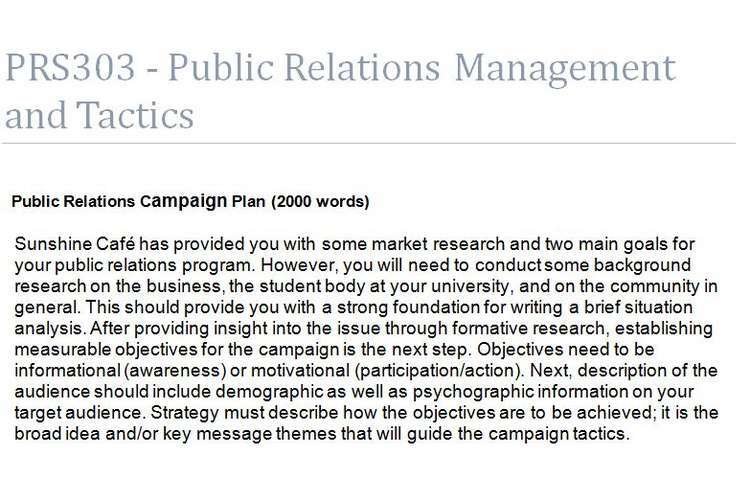 Sunshine Café has provided you with some market research and two main goals for your public relations program. However, you will need to conduct some background research on the business, the student body at your university, and on the community in general. This should provide you with a strong foundation for writing a brief situation analysis. After providing insight into the issue through formative research, establishing measurable objectives for the campaign is the next step. Objectives need to be informational (awareness) or motivational (participation/action). Next, description of the audience should include demographic as well as psychographic information on your target audience. Strategy must describe how the objectives are to be achieved; it is the broad idea and/or key message themes that will guide the campaign tactics. Tactics are the activities that will put strategy into business operation. The implementation of tactics should focus on student- centered values and activities such as good food and coffee, social networks, classes, music, school organizations, and free events. Each strategy should have at least one tactic to accomplish to implement the strategy. A timetable should be set, scheduling tactics throughout the academic year. Finally, a budget should be developed that stays in line with the dollars initially allocated to the program. Most budgets include both staff time and out-of-pocket expenses in order to itemize the costs associated with a program plan. However, students must remember that no money has been allocated for advertising. Students are required to complete three case studies. Your answer must be both uploaded to Moodle in word file and handed over a printed copy with signed coversheet. You need to support your answers with appropriate Harvard / APA style references where necessary. Only include information in your appendixes that has been directly referred to in the body of your document. Include a title/cover page containing the subject title and code and the name, student id numbers.